2. Incoming solar radiation involves all wavelengths of the electromagnetic spectrum. The atmosphere is transparent to most wavelengths, but part of the solar spectrum are absorbed by certain greenhouse gases in the atmosphere. Which of the following is NOT considered a greenhouse gas? 3. The amount of water vapor in the air can range from trace amounts up to about 4% by volume. Which of the following statements is NOT true? a. Warm air can hold more moisture than cold air. b. The amount water moisture that air can hold depends on factors including temperature, air pressure, and the amount and kinds of particulate matter dispersed in the air. c. When air has reached the maximum amount or water it can hold it is called saturated. d. Moist air is heavier than dry air. a. averages about 1000 millibars. b. increases in pressure when stormy weather is taking place. c. decreases in pressure when cold, clear air masses moves into an area. a. surface winds blow from high to low pressure. b. high pressure systems have dry conditions with sinking air masses. c. low pressure systems have wetter conditions with rising air masses. 6. When a warm, moist air mass (a maritime-tropical air mass) encounters a cold, dry air mass (a polar continental air mass), what happens? a. cold air moves in over the warm air, causing precipitation. b. both warm fronts and cold fronts can form, possibly resulting in precipitation. c. cold air rises, forming clouds, resulting in snow. d. warm air sinks, forming clouds, resulting in rain. 7. Tiny (very microscopic) dust particles and aerosols can become cloud condensation nuclei (CCNs). CCNs come from many sources: dust storms, fires, volcanoes, sea spray, plants, and pollution. If there are too many CCNs in the air, what happens? a. It rains more intensely. b. Smog turns to fog. c. Rain droplets (or ice crystals) don’t get big enough to fall as rain (or snow). 8. The fog often called the marine layer in coastal California is generally most often what kind of cloud? a. low pressure systems (like hurricanes) turn counter-clockwise in the Northern Hemisphere. b. high pressure systems turn clockwise in the Southern Hemisphere. c. maximum coriolis effect is at the equator and does not occur at the poles. d. All of choices are correct. a. tropical depressions move north across the equator. b. average wind speeds in the heart of the storm rise above 38 mph. c. average wind speeds in the heart of the storm rise above 74 mph. d. average wind speeds in the heart of the storm rise above 155 mph. 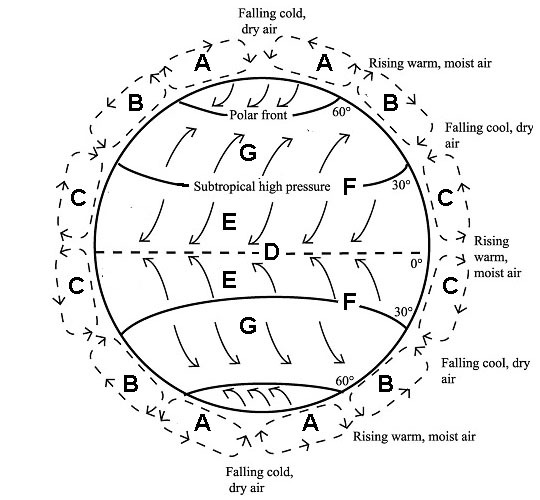 Questions 11-14 refer to the Global Atmospheric Circulation diagram below. The polar circulation cells (60° to 90° N and S) are shown as letters A. The Ferrel circulation cells (30° to 60° N and S of equator) are letters B. The Hadley circulation cells (0° to 30° N and S of equator) are letters C.
11. Which letter represents the Inter-tropical convergence zone (ITCZ)? 12. The NE and SE Trade Winds are represented by which letter? 13. The zone of potentially dangerous winds of the horse latitudes are represented by which letter? 14. Doldrums where sailing ships can be trapped without winds for extended periods of time are most common in the zone represented by which letter? 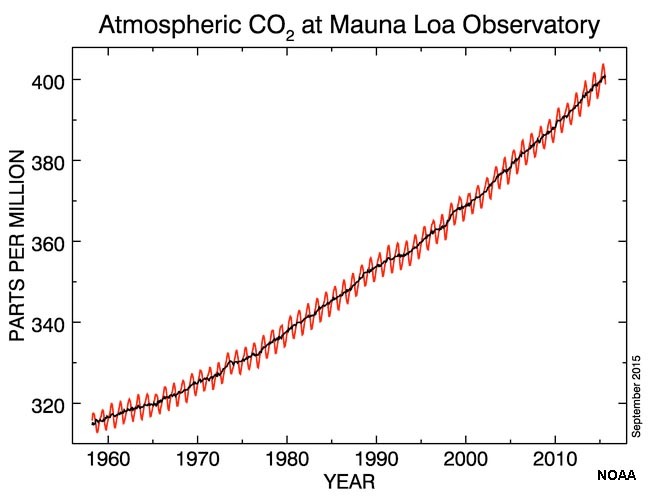 a. carbon-dioxide concentrations have been steadily increasing for the last 50 years. b. seasonal growth and decay of plant leaves in the northern hemisphere cause minor but measurable fluctuations in carbon-dioxide concentrations. c. carbon-dioxide created by the burning of fossil fuels is being produced faster than the oceans can absorb and consume the gases.